Former justice minister Jody Wilson-Raybould shown giving her testimony about the SNC-Lavalin affair before a justice committee hearing on Parliament Hill on Feb. 27, 2019. The Prime Minister’s communications director, Cameron Ahmad, told The Globe and Mail that the information about the Crown prosecutor did not come from the Public Prosecution Service. 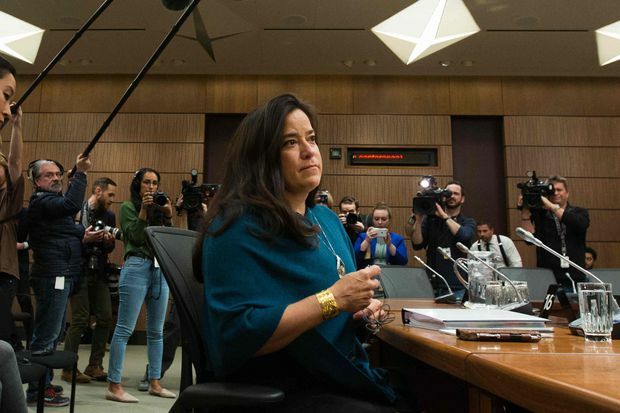 Ms. Wilson-Raybould told MPs that the senior PMO advisers were pressing her to seek outside legal opinion on a deferred prosecution agreement (DPA) with SNC-Lavalin. This was part of a high-level effort by Mr. Trudeau’s office to persuade her to override Ms. Roussel’s decision to prosecute the Montreal engineering and construction giant, she said. A spokesperson for SNC-Lavalin told The Globe that it had no idea what went on within Ms. Roussel’s office or the reasons behind the decision to proceed with a criminal trial rather than negotiate a DPA. “We know nothing of the internal workings or decision-making within the office of the DPP [director of public prosecutions] or PPS and consequently could not have, and did not, inform anyone in government or elsewhere of any such positions,” said Daniela Pizzuto, director of external communications at the Montreal-based firm. Mr. Ahmad was asked if he could shed further light on why Mr. Trudeau’s top aides would have inside information on discussions that might have taken place with the Public Prosecution Service. “I don’t have any changes to my previous answer,” he said in an e-mail. A spokesperson for Ms. Roussel declined to say if there were internal disagreements about negotiating an out-of-court settlement with SNC-Lavalin, but the official was adamant that no one in the Public Prosecution Service would have shared details of the case to outsiders. “The prosecutors did not indicate to SNC-Lavalin or anyone else any opinion as to whether an invitation to negotiate should be issued, and counsel for SNC-Lavalin were always informed that the decision would be taken by the DPP. The prosecutors had no discussion with PMO,” said Nathalie Houle, who handles media relations at the Public Prosecution Service. The Sept. 16 conversation took place the day before Ms. Wilson-Raybould had a meeting with Mr. Trudeau and Michael Wernick, Clerk of the Privy Council. She testified that they pressed her to overrule Ms. Roussel and negotiate a settlement with SNC-Lavalin. Michael Lacy, president of the Criminal Lawyers’ Association, said that it would be “completely improper” for a government official to reach out directly to a federal or provincial prosecutor to reconsider how they exercise their discretion. But the PMO may have become aware of the front-line prosecutor’s position, without having learned of it directly from the prosecutor, or from SNC-Lavalin, he said. NDP MP Murray Rankin, a former defence lawyer, said it would be completely inappropriate if the PMO was attempting to learn information about the court case from the prosecution. Peter MacKay, a former attorney-general and justice minister in a Conservative government, called the testimony from Ms. Wilson-Raybould troubling, and said it points toward a heightened level of political interference in the prosecution of SNC-Lavalin, especially if there were direct contact. “It smacks of a whole new level of attempts to influence in a very nefarious way the course of justice,” Mr. MacKay said in an interview. Michael Bryant, a former Ontario Liberal attorney-general, and now the head of the Canadian Civil Liberties Association, said questions around possible contact with the individual prosecutor highlight a need for more information. “That today we have no clear answer on this adds fuel to the argument that more answers are needed from Jody Wilson-Raybould and everybody involved,” he said in an interview. Any direct contact would demonstrate “an extraordinary effort to interfere with an individual prosecution. It’s not all that unusual for a prosecutor to be at odds with their boss but for the PMO to try to play one side off against the other is unheard of. That goes well beyond input and looks like manipulation and obstruction,” Mr. Bryant said. Ms. Pizzuto said the only information provided to SNC-Lavalin from the prosecution service was an Oct. 9, 2018 letter, informing the company that it would not be invited to negotiate a DPA. However, documents filed in Federal Court show SNC-Lavalin had actually been notified in early September that its bid for a deferred prosecution agreement, also called a remediation agreement, had failed. A letter from the Public Prosecution Service – filed in the SNC-Lavalin court case seeking a judicial review of the decision to prosecute – shows company lawyers were informed on Sept. 4 that the government intended to go ahead with the prosecution. The document says this had “been communicated” to the Quebec company’s lawyers on that date. A federal court rejected the judicial review earlier this month. The Globe reported on Feb. 7 that the PMO put pressure on Ms. Wilson-Raybould in the fall of 2018 to shelve the criminal charges against SNC-Lavalin relating to its business dealings in Libya. She refused. In January, she was demoted by Mr. Trudeau to Veterans Affairs. Since then, Ms. Wilson-Raybould and former Treasury Board president Jane Philpott have resigned, as has Mr. Trudeau’s principal secretary Gerald Butts. A week ago, Mr. Wernick, Privy Council Clerk, retired saying he had lost the trust of the opposition parties over the SNC-Lavalin affair. Federal Ethics Commissioner Mario Dion has also launched his own probe into the matter and Conservative Leader Andrew Scheer has asked the RCMP to investigate possible obstruction of justice. "If nothing wrong took place, then why don’t we waive privilege on the whole issue and let those who have something to say on it speak their minds and share their stories,” she told Maclean’s magazine. In a letter Friday to Anthony Housefather, chair of the justice committee, Ms. Wilson-Raybould indicated that she still cannot talk about the period of time when she was shuffled out of the justice ministry in early January to her resignation from cabinet last month because of cabinet confidentiality and solicitor-client privilege. The Prime Minister told reporters on Friday that there was no need to grant another waiver to Ms. Wilson-Raybould, saying the justice committee had “full airing” of the matter. On the same day during a town hall in Thunder Bay, one man asked why the Prime Minister has cited the possibility of 9,000 jobs being lost as the government’s motivation for repeatedly asking Ms. Wilson-Raybould about the possibility of obtaining a DPA. The man pointed to news reports in which the chief executive of SNC-Lavalin said he never spoke to Mr. Trudeau about potential job losses if there was no DPA. Mr. Trudeau replied that there are 9,000 or 10,000 jobs at SNC-Lavalin across the country “and, if the company were to go through full criminal prosecutions, those jobs absolutely could be at risk.” It is the responsibility of a government, he said, to say ‘Okay, how do we protect workers that had nothing to do with the bad decisions of the leaders of the company and we don’t want the workers to be penalized for it?’"